Review: Gravity Graffiti present more mesmerising sounds from far-flung reaches, this time showcasing the music of debutant Thai producer Anurak Boonliang. 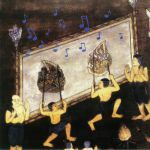 According to the label, Boonliang is steeped in classical Thai music training, and now applies his background to drum computers and synthesisers. The results are astounding, characterized by nimble melodic and percussive programming that moves between regimented rhythmic shapes and more free-flowing patterns with grace and elegance. "Reality" brings Boonliang's roots into focus with a field recording of what we assume is a traditional Pi Phat musical ensemble. If you're in the mood for fresh electronics unbound by the familiar structures embedded in Western culture, look no further.